The Black Banded Angelfish Apolemichthys arcuatus, also known as the Black Bandit Angelfish has a black line extending horizontally from over the eye to the end of the dorsal fin. 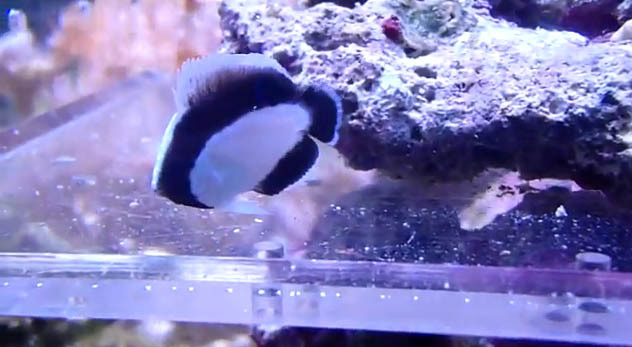 The Black Banded Angelfish is hermaphroditic, meaning it has reproductive organs normally associated with both male and female, and is pretty much impossible to to differentiate between male and female by coloration. This particular one is available at Blue Harbor, is absolutely beautiful, and has been feeding on brine shrimp. Wow, that one is crazy looking, the black band is so thick. Bandit Angelfishes are found only in Hawaii, and because they are so coveted by aquarium hobbyists, they are disappearing from Hawaii’s reefs – once common, they are know rarely encountered. Hawaii collectors are allowed to take them in unlimited numbers. Please stop buying these fish – buy only maricultured animals. To do otherwise is to contribute to the demise of abundant, healthy and bio-diverse reefs.